The XR 5000 Bluetooth allows it to remotely link to all computers, as well as the XRS ID Chip Reader, so long as they are within 100m. All XR 5000 Bluetooth users can use their Smartphones to easily download data stored on their weight read-out unit. This model comes with even more analytical functions for better informed decision-making. Includes all the ID 5000 features. The new XR 5000 Bluetooth incorporates all the existing features and flexibility of the ID 5000 Bluetooth with the added benefits of wireless communications to Bluetooth EID readers and Bluetooth laptops or PDAs. The Bluetooth module is incorporated into the internal design of the XR 5000 Bluetooth, removing the need for serial cables and dongles. Included is a Bluetooth USB stick for your laptop or PC. NEW Superdamp 4TM technology means that it weighs faster than ever before. The XR 5000 Bluetooth comes with Bluetooth enabled as a default setting. Bluetooth info screen on the XR 5000 Bluetooth gives the user up to date information on what device their XR 5000 Bluetooth is connected to, with signal strength and device name displayed. With the facility to connect to up to two Bluetooth devices simultaneously, the XR 5000 Bluetooth allows communications with an EID reader and a laptop at the same time. Class 1 Bluetooth allows the XR 5000 to communicate over distances of up to 100m. 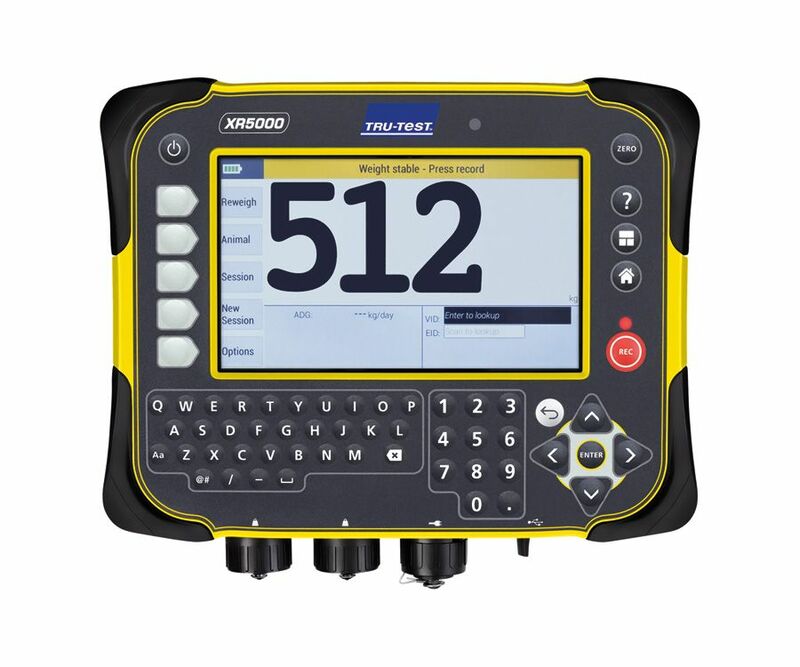 The XR 5000 Bluetooth is the most advanced livestock-weighing read-out unit available. The XR 5000 Bluetooth is for users who intensively monitor individual animal performance and collect a variety of lifetime and reoccurring animal data. The XR 5000 Bluetooth has multiple data entry fields that can be customized to suit your own data collection requirements. Bluetooth enables wireless communications with EID readers and laptops up to 100 m. No need to connect any serial cables. Use onboard laptop Bluetooth or extend the range by using the supplied Bluetooth USB stick. Up to 1 million individual animal records. Alphanumeric keypad for naming files, entering animal codes and ID numbers. 100 custom character code fields for recording additional animal information. User definable data field names to suit specific requirements. Advanced users can tailor data field sizes to maximize memory use. Build your own custom reports in addition to the standard statistics features. Use filters to focus on the performance of specific groupings of animals. Animal history table provides full history for an animal and includes all recorded data such as weight, treatment, witholding periods, alarm setting and birth rates. Track mother and offspring pairing feature. Up to ten-way drafting. Drafting can be based on weight, and pre-entered non-weight factors such as breed or birth rate. This model is compatible to all management programmes, i.e Microsoft, Farmplan, Agridata etc. Management Programmes can be downloaded off the internet, F.O.C., on request (www.tru-test.com). Interface cables are supplied with the XR 5000. C16 connector for power. Use supplied mains power adaptor only.